Pierino Algieri is a landscape / nature photographer born and raised in the picturesque Conwy Valley, Snowdonia, North Wales. He has a comprehensive library stock of images of North Wales. Pierino has recently published a new book of photos of Snowdonia. Llyfr newydd. Eidalwr yn Eryri. New book - Pierino's Snowdonia. 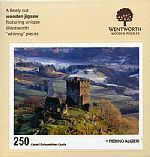 Traditional wooden jigsaw puzzles, available in four sizes. Maxi, Midi, Mini, Micro. Very High Quality Coasters 11.5cm x 9.5cm. Minimum order of 4 coasters @ £2.75 each. Calendars with views of North Wales. Cards for Christmas with a Welsh flavour. Blank cards and notepads that can be used all year round. Gift vouchers available in £10, £25 or £50. Pierino won the Rural Landscape category of the Countryfile Photographic Competition in 1998 with his picture of the Miner's Barracks above Capel Curig. A new and unique collection of wooden jigsaw puzzles, placemat/coaster sets, individual high quality hard glazed coasters. Diary, calendar, notecards. A new bilingual book of my photography is due out in summer of 2013. Interesting stories accompany the pictures. Signed copies will be available from my website, shows & craft fairs.